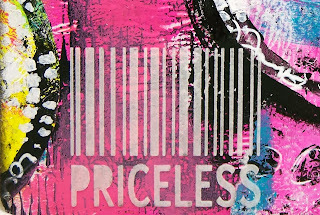 Edited to add that this project was featured on the Gelli Face book page! 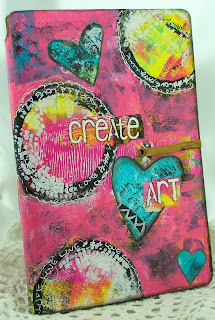 Hi Everyone, it's Sue Lelli here to show you a Dylusions Art Journal I covered with Gelli papers. 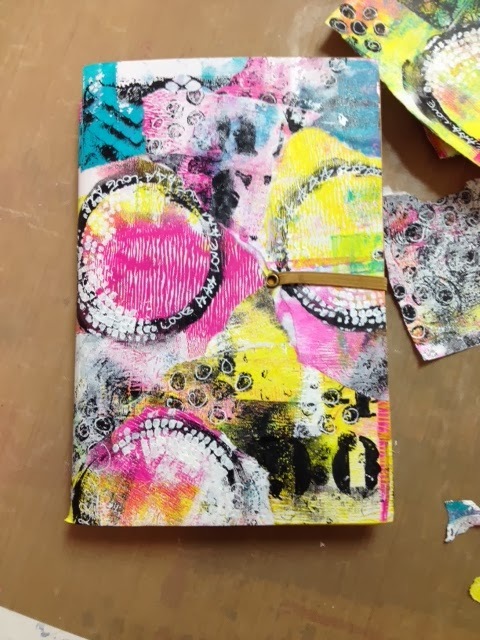 I recently took a class with the talented Stephanie Ackerman (LOVE) and I put what I learned to good use on this project! This is the end result! I'm pretty pleased with how it turned out! I'll show the process later however it was made by tearing and adhering pieces of Gelli papers I made first. 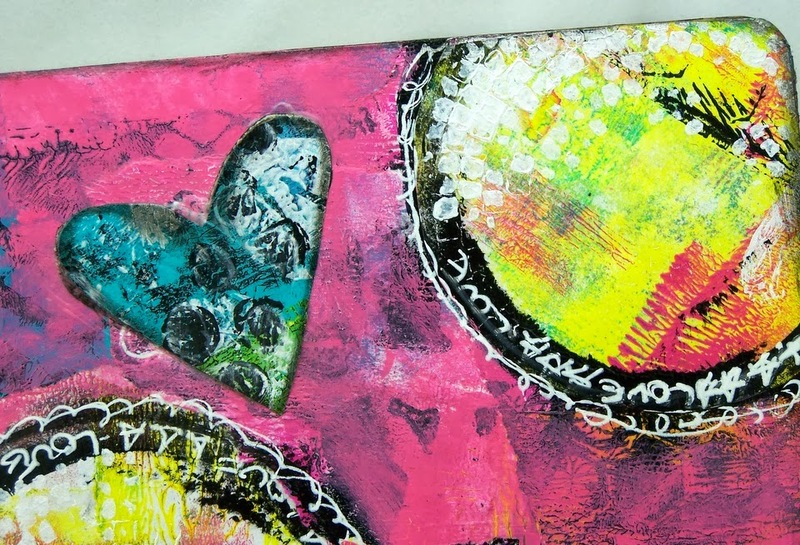 If you haven't used a Gelli plate before, it is so much FUN! 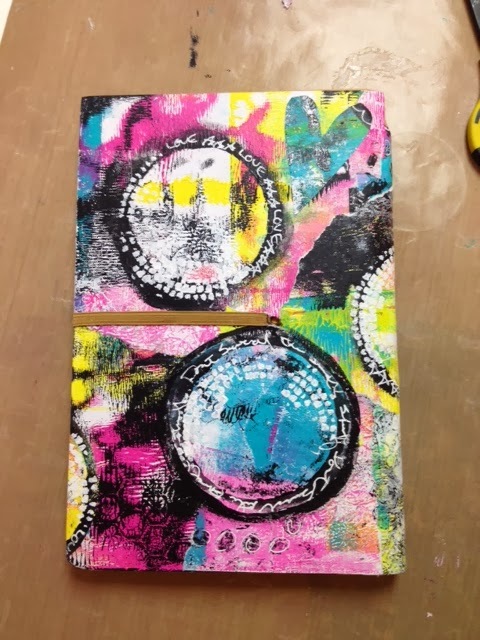 You use a brayer to roll different paint colors onto sheets of paper and just keep adding layers and designs until you think you are done! 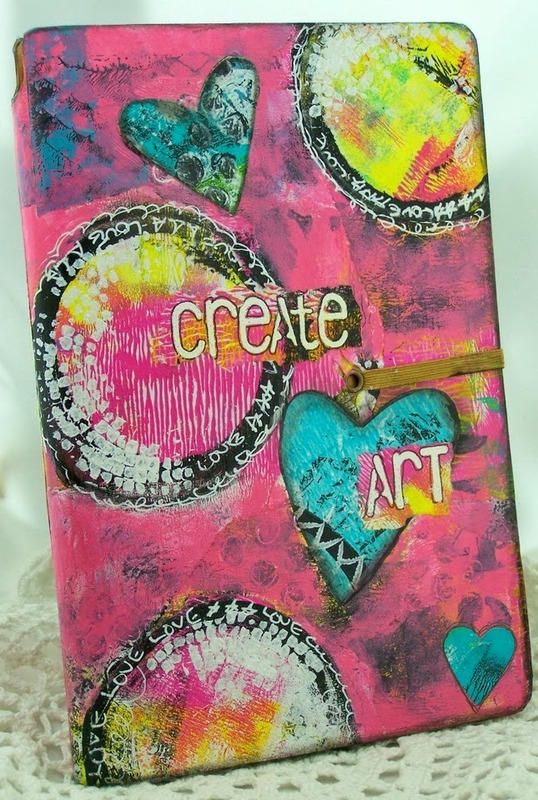 I used my Catherine Scanlon Journal Words stamp set to title my book Create Art. I stamped the words with Versamark onto scrap pieces of Gelli paper and white heat embossed them. Here you can see the circle I drew and doodled in with white. 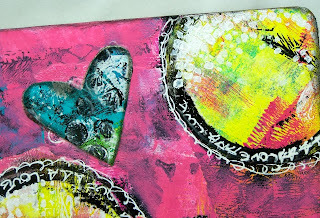 I also cut out hearts from gelli papers. The little white tiny dots were made by pouncing white paint through a round embroidery plastic mesh piece. I LOVE this detail! This is the back of my journal. 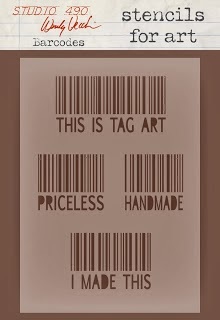 Do you see the barcode? 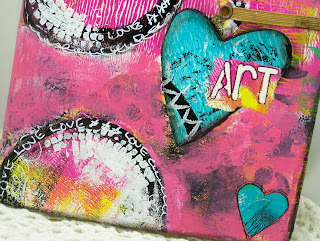 I applied Wendy Vecchi's white embossing paste through her stencil. 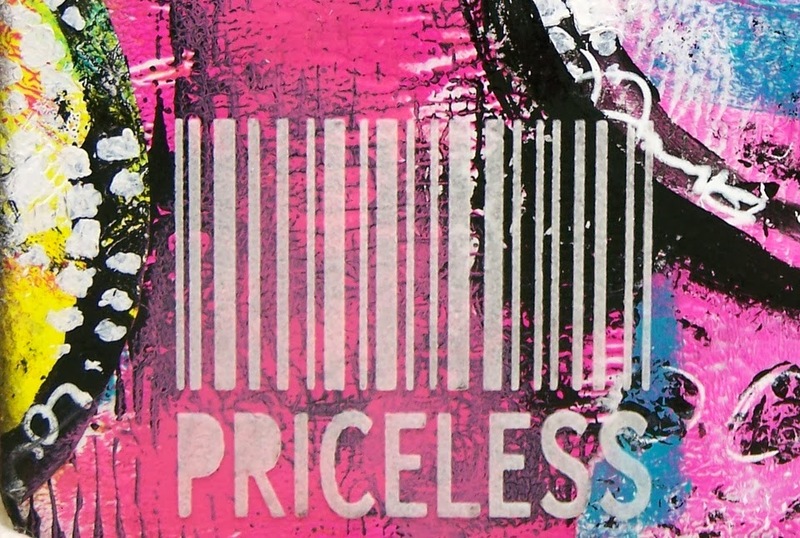 Here's a photo of Wendy Vecchi's Barcode Stencil which I could use on almost EVERY project! That's how much I LOVE it! 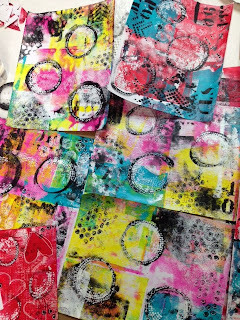 Here are some of the Gelli papers I made. This shows you what the front looks like after I have applied random strips of paper to the journal with mod podge. 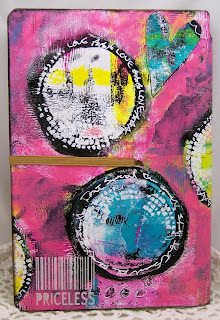 Personally I thought it was a lot to look at so I took hot pink paint and rubbed it around my circles and hearts. I also added more hearts to the front. You know - that rule of three thing! Here it is again in case you have forgotten! You can purchase all of these products I used in the eclectic Paperie store. Happy Shopping! Stunning! This is just amazing, Sue! 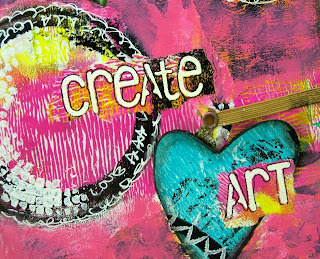 Time for me to get out my gelli plate! I love every corner of this page! So inspiring! Thank you for posting this! Sue this is just beeeautiful, love the vibrant colours and the hearts...loove!! Sue, this is just fabulous! I LOVE everything about it! Absolutely beautiful. 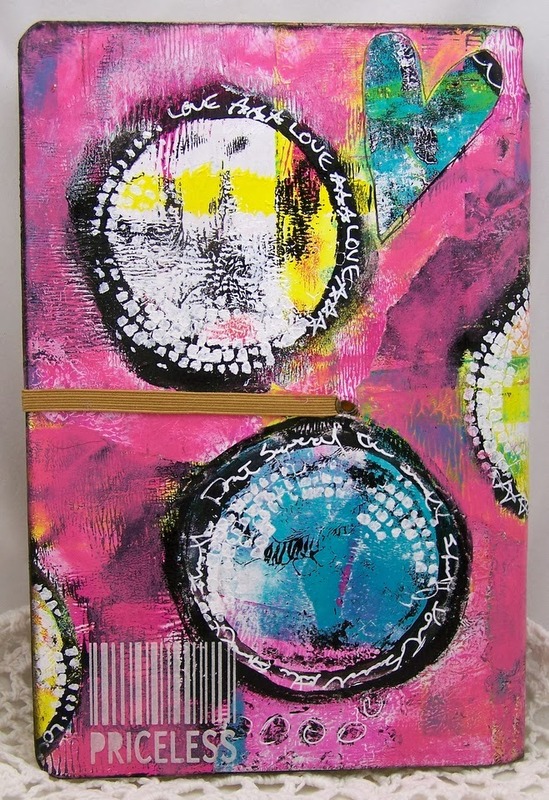 Love the depth and definition and the bright colors. Awesome way to finish the cover.